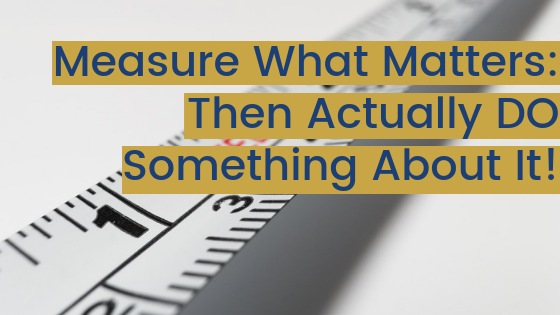 Measure What Matters: Then Actually DO Something About It! We can measure and monitor so much in business now. But how much of it REALLY makes a difference to performance? And as importantly, how was the performance improved? What emphasis is placed on the attitudes and behaviours as well as the results? The same level of performance can be achieved with the right attitudes and behaviours or with the wrong ones (think Banking Royal Commission). We have a tendency to measure what’s EASY to measure rather than what actually matters. And then we get surprised that our reputation in the market is not as positive as we’d like it to be, even when our metrics are strong. So often, we hope that somehow monitoring automatically produces change. Think about engagement surveys, customer satisfaction surveys and productivity reports. Companies pay a very large sum to get these done. Then do them again a year later HOPING for better results. What goals were set and implemented? What actions were taken to drive the improvement you wanted? Knowledge is powerful. But it’s what you actually DO with that knowledge that’s going to make or break your business. What really matters in our business? What are the results, attitudes AND behaviours that actually matter? How do we measure these? Hint: percentages and absolute numbers are not the only way nor often the most appropriate way to measure some of what matters. With every measurement what is the action we then take? An action of celebration because we’ve hit the target? Or an action of change/improvement to drive towards the metric we want to achieve. What did you do with your most recent survey results? In your performance review system are you measuring what matters or what is very easy to measure? And …. what will you do differently, as a result of reading this post? About to do PERFORMANCE REVIEWS in your business? CLICK HERE to check out our dynamic 2 hour workshop in Sydney. You’ll discover HOW to have conversations that genuinely drive performance, and get the results you WANT rather than the reaction you fear!